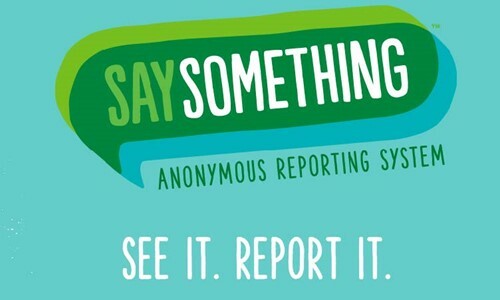 As part of a coordinated collaborative effort of all Stark County School districts, Marlington Local Schools has begun using the Say Something Anonymous Reporting System (SS-ARS). This is a reporting system that is being implemented in all middle schools and high schools in Stark County and will provide the opportunity for students and adults to submit anonymous tips via a mobile app, a website, or a crisis telephone hotline that is staffed 24/7 with a licensed counselor. The tip line is 1-844-5-SAYNOW. SS-ARS is sponsored by an organization called the Sandy Hook Promise, which is a non-profit organization founded and led by several family members who lost loved ones at Sandy Hook Elementary School in Newtown, Connecticut on December 14, 2012. Their aim is to provide programs and practices that protect students and staff while preventing the senseless and tragic loss of life. There is a mobile app, website, and a 24/7 phone hotline to provide anonymous tips that will be routed to school officials in situations where school intervention is needed.